The most splendid ventilation shaft in London. 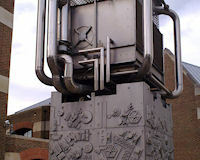 Description: Just on the concrete concourse outside Pimlico station pop artist Sir Eduardo Paolozzi (1924-2005) converted an ugly ventilation shaft for the car park below (not the underground as is commonly mistaken) into an impressive piece of industrial art. The fascinating structure is covered in panels with cogs, insects, satellites, gears and machine parts, and was installed in 1982. Today it is listed at Grade II for this reason Artistic interest: a cast metal sculpture of high artistic and aesthetic quality, high tech in spirit with exposed and celebrated mechanical features and an anthropomorphic robotic quality. 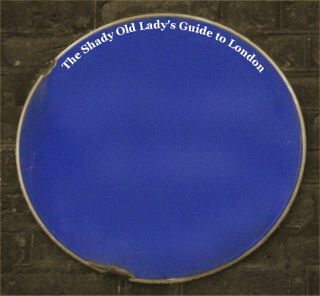 Its location in its original setting contributes to its significance, but the artistic interest of the sculpture is not dependent on its locale. The ventilation shaft cover was commissioned by the Crown Estate Commissioners through Whitfield Partners who, between 1976 and 1983, designed and constructed two commercial blocks on either side of it.